For those of you that follow my blog, you know that I am the mom of a girl - and only a girl. 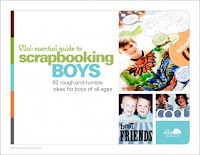 So you might be wondering what I might have to say about Ella's newest eBook release - Ella's Essential Guide to Scrapbooking Boys. It's true...I don't have any boys. However, I am a die-hard Ella fan and it's hard for me not to want every title they produce. But beyond that...while my girl can certainly be a girly-girl (she loves her dolls and dance class), she can also be a bit of a tomboy. She LOVES fishing with her dad. She baits her own hooks without a grimace. She also isn't squeamish about holding reptiles that most girls would simply yell "Ewww!" and run in the opposite direction. We have a pet salamander named Sally which she loves to hold...quite original name, huh? Just a couple examples of my well-rounded girl for you! So, even though I might not be mother to a boy, I still found a wealth of ideas in this eBook that will be translated into my own scrapbooks! And, even if your girl is a complete and uncontested diva, many of the ideas in this eBook can be adapted just the same. 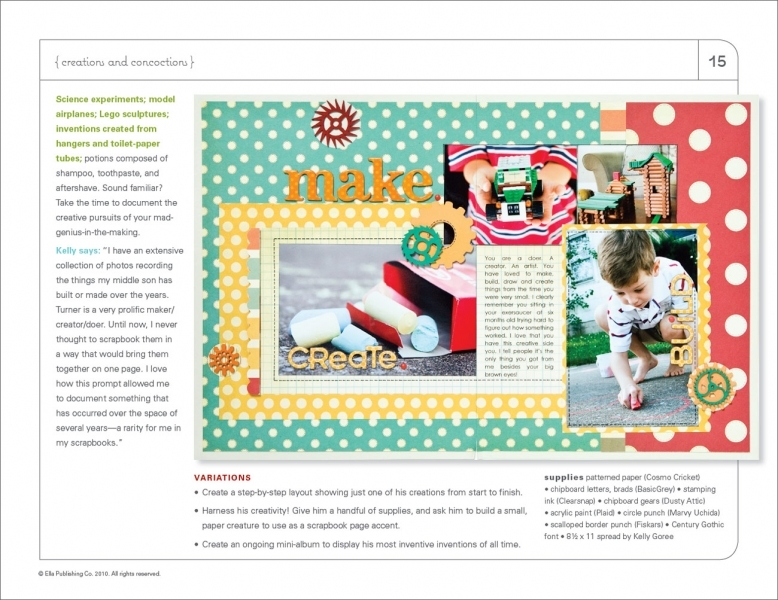 The subtitle of Ella's Essential Guide to Scrapbooking Boys is "92 rough-and-tumble ideas for boys of all ages." There are 20 primary ideas in this eBook along with a wonderfully designed example from one of the contributors. The additional 72 ideas come in the form of 2-3 suggested variations for each of the primary ideas. Each contributor also shares their favorite product combination for winning boy-style under a "Make it Masculine" tab. For example, Wendy likes oversized letters, arrows and the colors orange and blue. There are also 10 bonus tips included in the eBook to help add extra flair and winning style to your layouts. 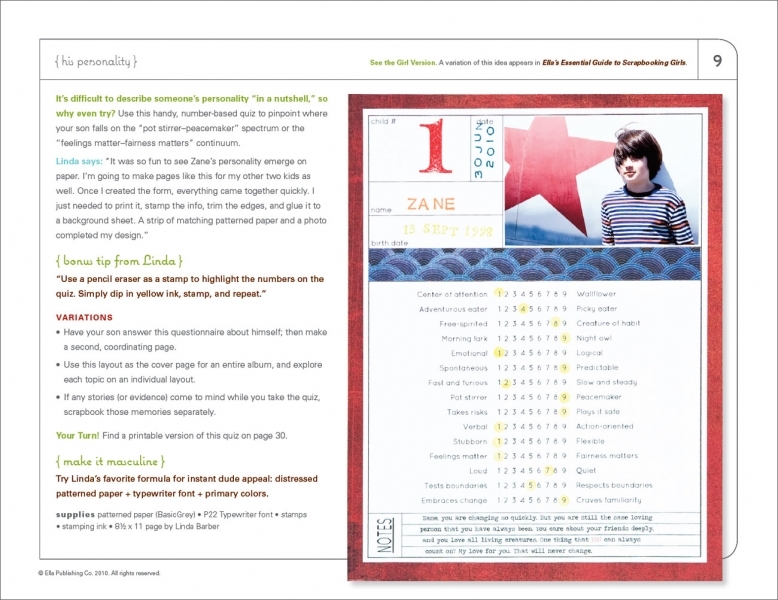 At the end of the eBook, each contributor shares their opinion on how often the topics covered in the book can be revisited in your scrapbooks. Some are a once-in-a-lifetime type subject while others can be revisited yearly to give a complete picture of your growing child. I have one free download to give away to one lucky reader. All you need to do is answer the following question by 5 p.m. on Friday, October 15, 2010. What is your favorite way - either product or technique - to add a little masculine style to your layouts? Random.org will choose and I'll announce the winner on Saturday!